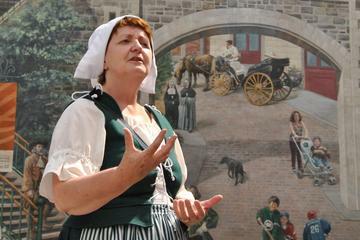 Revisit Quebec’s fascinating history on this 2-hour small-group tour of Old Quebec City. A guide will meet you in period costume and lead you through 400 years of exciting history as you wander the only walled city in North America. Visit Place Royale, considered the birthplace of French civilization in North America, and see the magnificent Château Frontenac and the Basilica of Notre-Dame de Québec. A friendly local guide will lead you through the city, which is listed as a UNESCO world heritage site. This small-group tour ensures a more intimate experience. Very much enjoyed our tour! Our guide was excellent and very informative! She made the tour very enjoyable! Our guide, Noel was fantastic!! He made the history very,very interesting!! Would recommend to anyone interested in the history of this beautiful city. Our tour guide was excellent and extremely knowledgeable. We learned so much from her. I would recommend this tour as a great way to start your visit to Quebec. Our guide was excellent, brought the city's history to life. Lots of up and down hill walking, so wear comfortable shoes. Like everything I experienced in my several days stay in old Quebec City, this walking tour was excellent. Our guide was in character as the first white woman to settle in Quebec City and gave us a unique view of the life and history of the times. The stories she shared from a 'first hand' viewpoint were invaluable in gaining an insight into the realities of life and its hardships, and the politics, centuries ago. Loved it! Our family all agree that this tour was a highlight of our trip. The costumed guide had a delightful personality, working hard to engage two children and the adults. She had a real story of being a Kings Daughter true of a long ago ancestor which she used to bring Quebec City alive. This tour was fabulous! Our guide was very knowledgeable about the city of Quebec. He also told us places to go to after the tour to learn more, we highly recommend this tour. I especially liked the parts of the walk in the lower town. It gave me a good introduction to the old city in general because I did it on my first day. The guide stayed in her character so that helped with the history of the city. The tour guide was excellent. We visited many of the cathedrals in the area as well as many of the other historical highlights. The tour was well worth the price.